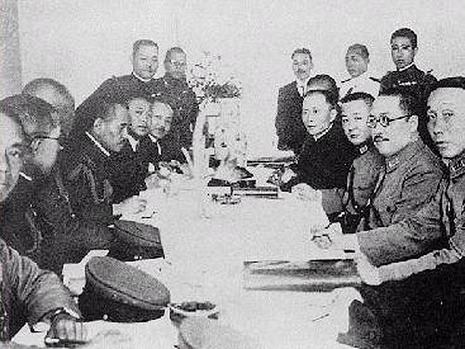 The Tanggu Truce resulted in the de facto recognition of the existence of Manchukuo by the Kuomingtang government, and acknowledgement of the loss of Rehe. It provided for a temporary end to the combat between China and Japan and for a brief period, relations between the two countries actually improved. On May 17, 1935, the Japanese legation in China was raised to the status of embassy, and on June 10, 1935, the He-Umezu Agreement was concluded. The Tanggu Truce gave Chiang kai Shek time to consolidate his forces and to concentrate his efforts against the Chinese Communist Party, albeit at the expense of northern China. However, Chinese public opinion was hostile to terms so favorable to Japan and so humiliating to China. Although the Truce provided for a demilitarized buffer zone, Japanese territorial ambitions towards China remained, and the Truce proved to be only a temporary respite until hostilities re-erupted with the start of the Second Sino-Japanese War in 1937. Despondent Chinese patriots cheered up a little when they heard the terms of the truce. Though it kept their armies out of an area south of the Great Wall as big as Ohio, and kept Japanese patrols inside to watch for "provocations," it saved face for Chiang Kai-shek by two omissions. It said nothing about Chinese recognition of the puppet state, Manchukuo, nothing about Japanese control of the railway from Peiping to Tangku. Besides saving Chiang Kai-shek's face, the omissions showed that Japan prefers to deal with him rather than with the scrabbling warlords who would take over China if he fell.